Traditionally fashioned to look like a log, this festive cake is filled with a luscious chestnut cream and covered with dark chocolate “bark.” Make the filling first, as the cake must be filled very soon after baking. The delicious sponge cake contains cocoa and potato starch in lieu of flour and rises thanks to all the beaten egg whites. Be sure your eggs are fresh, or they won’t stiffen properly. Chestnut spread is available in many supermarkets during the holidays and year round online. You can find instructions for making marzipan acorns here. Heat the oven to 375° F. Butter the sides of a 10 x 15-inch jelly roll pan, and line the base with baking parchment, anchoring it with a dab of butter at each corner. Butter the paper too. Filling: Beat the butter until creamy, then beat in the chestnut spread, Egg beaters and rum. Set aside. Cake: Combine the cocoa, potato starch and salt and set aside. Using an electric mixer, whip the egg whites until they form soft peaks from a raised beater. Gradually add ¼ cup of the sugar, and beat until stiff peaks form. Without delay, quickly beat the egg yolks and remaining ½ cup of sugar in a separate bowl until thick and pale. Add the vanilla, and beat in the cocoa mixture. Fold into the whites, and spread the batter evenly in the pan. Bake for 12 to 15 minutes, or until the cake springs back to a light finger touch, just starts to color, and shrinks a little from the edges of the pan. Be careful not to over bake, or it won’t roll. Dust the cake with a layer of confectioners’ sugar. Run a knife blade around the edges. Cover with a clean cotton (not terrycloth) dishtowel and a large wire rack, feet facing up. Reverse the pan and rack together, and lift off the pan so the cake is resting on top of the towel on the wire rack. Tug the towel and cake onto a flat surface. Gently peel off the parchment paper, and trim off the crisp edges of the cake to promote rolling nicely. Starting at one of the short sides, roll the cake up with the towel. Let cool for 20 minutes. Unroll the cake onto a sheet of parchment paper, pulling the towel away at the same time. Spread with the chestnut filling to within ½ inch of the edges, and roll up again. Using the parchment as a sling, place on a flat plate, seam side down, and freeze for 10 minutes, which will make the cake easier to handle. Frosting: Beat the butter until creamy, and then beat in the chestnut spread and melted chocolate. Spread a thin layer over the cake, leaving the ends unfrosted, and freeze for 10 minutes. Spread the remaining chocolate frosting over the cake, leaving the ends unfrosted, and create a tree bark effect by running the tines of a fork over the surface. Freeze the cake for 20 minutes. Slice off both ends of the log at an angle to show the “tree rings” inside. Line a long, flat platter with two narrow sheets of wax or parchment paper, overlapping slightly at the center. (These get removed later.) Place the cake on top. Cover lightly with plastic wrap and refrigerate for at least two and up to 24 hours. Before serving, dust with a little confectioners’ sugar to mimic snow. 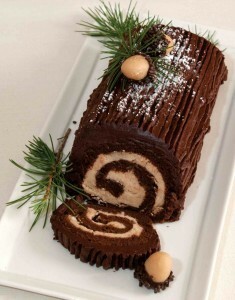 Pull the paper away from each side of the log, and decorate with marzipan acorns and tiny sprigs of fresh fir. Nutrition Analysis: 250 cal, 14 g fat, 135 mg chol, 60 mg sodium, 28 g carbs, 1 g fiber, 4 g protein. Recipes © copyright 2013 by Jacqueline Mallorca. The author of more than a dozen cookbooks, Jackie Mallorca’s latest titles include The Wheat-Free Cook: Gluten-Free Recipes for Everyone and Gluten-Free Italian.